Composite structure diagram is a kind of UML diagram that visualizes the internal structure of a class or collaboration. It is a kind of component diagram mainly used in modeling a system at micro point-of-view. Perform the following steps to create a UML composite structure diagram. In the New Diagram window, select Composite Structure Diagram. To create a class in composite structure, click Class on the diagram toolbar and then click on the diagram. Move your mouse pointer over the class. Click on the Resource Catalog button. Select New Part from Resource Catalog. 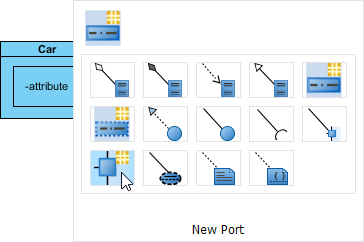 Select New Port from Resource Catalog. Right-click the port and select Open Specification… from the pop-up menu. 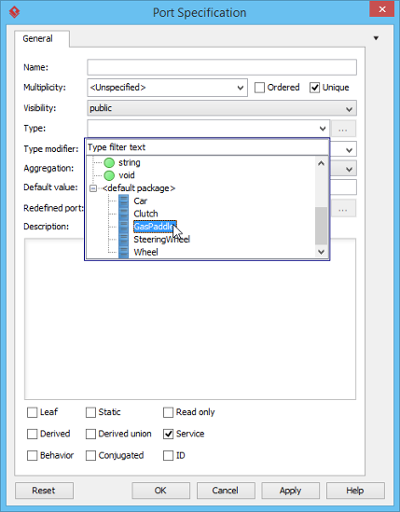 The Port Specification window appears. Click the combo box of Type and select a class. Click OK button to apply the changes. Type will be shown on the caption of the port. 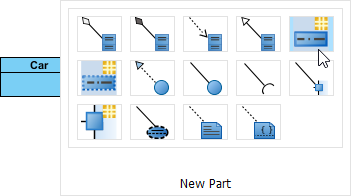 To create connector, click Connector on the diagram toolbar. Drag from the source shape, move the mouse over the target shape and then release the mouse button to create the connector.